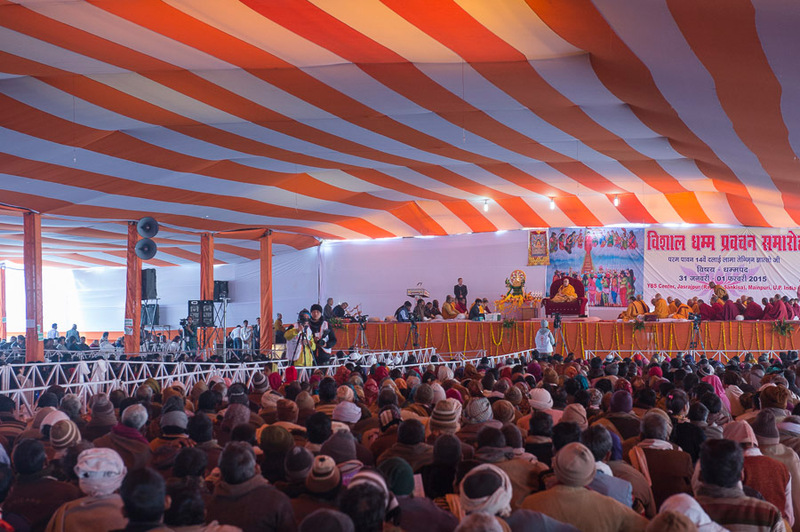 (TibetanReview.net, Feb02, 2015) – Tibet’s exiled spiritual leader, the Dalai Lama, spent three days at Sankisa, historically known as Sankasya, in Farrukhabad District of the Uttar Pradesh state of India, beginning Jan 30. The purpose was pilgrimage as well as to offer prayers and give religious teaching. The site is the most westerly of the eight principal places of Buddhist pilgrimage. He was received by the state’s Minister for Technical Education Mr Alok Kumar Shakya and also met with and had lunch with the state’s young Chief Minister Mr Akhilesh Yadav on Feb 1. Accompanied by monks of his Namgyal Monastery, the Dalai Lama, on reaching the site, offered a series of prayers at the foot of the stupa there after doing three prostrations. The visit was organized by the Youth Buddhist Society of India whose President, Mr Suresh Chandra Bauddha, welcomed the Dalai Lama, along with the district administration and police heads. Before beginning his teaching, which was on Dhammapada, on Jan 31, the Dalai Lama blessed an impressive new replica of the Sankisa Ashokan pillar that stands some 40 metres tall and is topped by a whole elephant capital complete with trunk and tail. 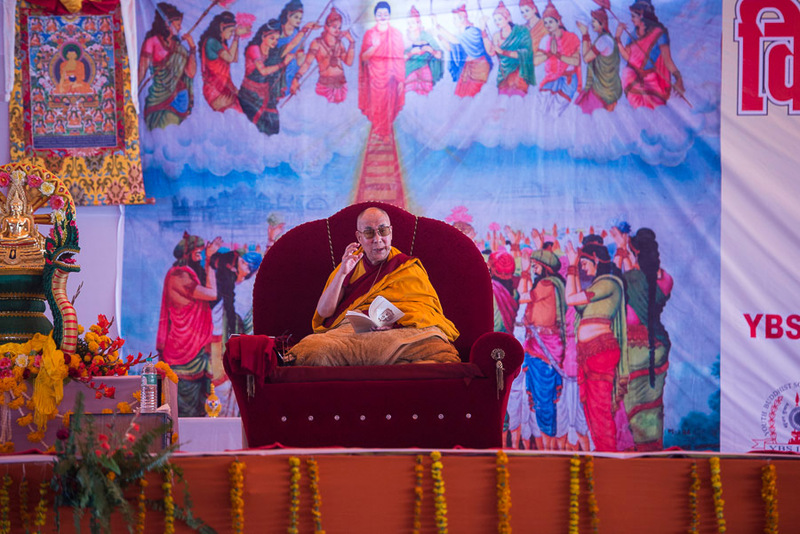 The estimated 20,000 people who attended the teaching included about 500 Indian Buddhist monks; about 1,000 Tibetans, many having travelled from Delhi; and about 50 foreigners from East Asia, Europe, North America and other parts of the world. The teaching began with a recitation of the Mangala Sutta in Pali by local monks, followed by the Heart Sutra mantra. The meeting with the state’s chief minister took place when the Dalai Lama returned to his hotel after concluding the teaching on Feb 1. 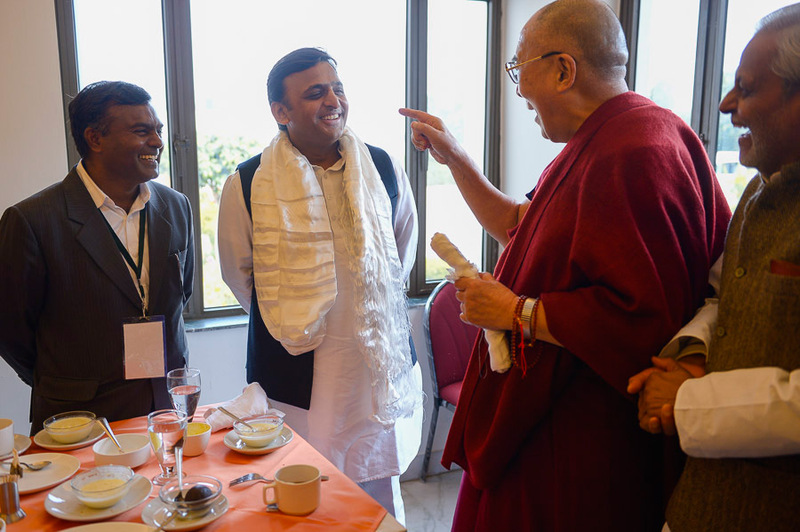 On the issue being taken up by him, the chief minister promised help for a Buddhist learning centre being planned by the Youth Buddhist Society of India at the Sankisa, which falls within the chief minister’s electoral constituency of Kannauj. The Dalai Lama also blessed a chörten (Stupa) built by the Shechen Monastery to fulfil the wish of the late Dilgo Khyentse Rinpoche who wanted such a project to be undertaken at Buddhist pilgrimage sites. The Rinpoche’s current reincarnation was present during the ceremony. Sankisa is also one of the four unchanging sacred Buddhist sites which include the Bodhgaya, where all Buddhas attain enlightenment; Sarnath, where they begin their teachings; and Shravasti, where they extend the teaching and defeat doctrinal opponents. At Sankisa all Buddhas descend to earth after spending the Rainy Season Retreat in the Heaven of Thirty-Three, teaching their mothers reborn there. Tibetan Buddhists celebrate the Buddha’s descent from the Tushita heaven every year on the 22nd day of the ninth month of their traditional calendar. The Dalai Lama had visited Sankisa for the first time in 1960, some nine months after coming into exile in India. On Feb 2 morning the Dalai Lama leaves New Delhi for a tour of Germany, the USA, Switzerland, Norway and Denmark.